When you meet Roi Et people in other parts of Thailand, they often make a joke and say they come from “L.A.” which is kind of Thai sense of humor as the “r” often sounds like a “l” in informal conversations and the English “a” is pronounced exactly the same way as the Thai “e” (เอ) and so “R.E.” becomes “L.A.”. Roi Et is located right in the heart of Isaan, and even though it would not even remotely remind one of Los Angeles in California, I would definitely count it to one of Thailand’s best kept secrets both in terms of nightlife and things to do and see during the day. You still don’t see many Farangs in Roi Et (both tourists and expats) and so there are only half a dozen foreign owned restaurants in town. And you get a lot of attention and smiles from the locals of whom many barely see any Farangs other than on television. If you want to get around town, visit all the places I’m about to talk about and not rely on the Skylabs (Isaan-style Tuk Tuks) all the time, you should definitely think about renting a motorcycle. Unfortunately there are no rental shops, however you can ask the guys from the Italian restaurant who usually do rentals for around 200 Baht a day. Or you do it like me and just talk to a guy selling fruit opposite the Roi Et Hospital asking if he had a bike to rent to me for a few days and yes, indeed he had one. He said he never done it before so I gave him my Thai driver’s license as a deposit and he also didn’t mention a price so I gave him 200 Baht per day, very fair rate for a rather old bike. “Roi Et” literally means one-hundred-one. The city used to be known as Saket Nakhon and received its current name because of its former 11 ancient gates to other cities that were under its control. The number 11 used to be written as “๑๐๑” which today is actually the number 101 and thus people misunderstood and gave the city the name “Roi Et” when it should have more appropriately been called “Sip Et”. Mai bpenrai. Alright enough for the introduction, let’s jump into the highlights of Roi Et! Like always with pictures, videos and the exact location on the map. 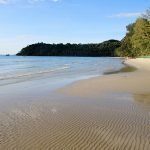 Every afternoon from about 4pm when the hottest hours of the day are over, locals of all ages pour into the Bueng Phlan Chai, a beautiful and spacious park and pond. There are young couples, students, adults who come from work, people who run around the scenic pond, families and elderlies all of them enjoying the relaxed and quiet atmosphere, buying snacks and drinks from the vendors or taking a pedalo trip on the pond (40 Baht per 30 minutes). Bueng Phlan Chai is located right in the center of town and it’s quite likely that you will come here almost every day during your trip as this is the place where Roi Et really comes to life. The majority of the very few foreign restaurants are also located here, most of them can be found at the western end of the pond. 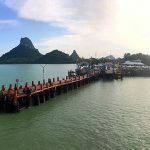 There’s also two sights you should give a visit: a tall walking Buddha statue at the northern end and the Sanlak Muang (city pillar) on a small hill with great views at the southern end of the island. Don’t get disappointed when I tell you that the nicest attractions in Roi Et province are its many temples. 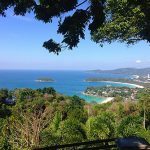 It’s not these kind of places you’ve visited already or passed by countless of times or allegedly hold relicts of the Buddha that no one can see. You’ll be amazed and don’t need to have a faible for Buddhism to really enjoy the following extraordinary and beautiful temples, Buddha statues and stupas in Roi Et. 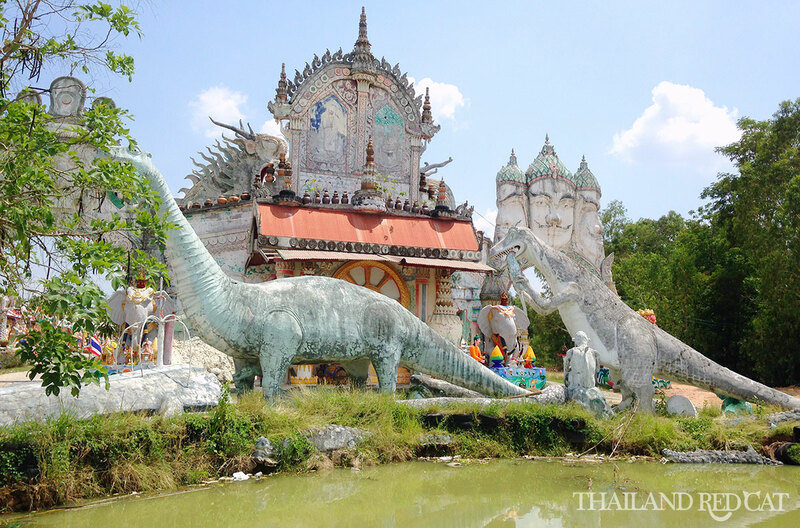 While most of the best temples in Roi Et are spread out in the plains several kilometers out of town, Wat Burapapiram is the most remarkable one in town and if you decide not to visit the countryside at all, then make sure you at least have a look at this one! It’s actually quite hard to miss it out as the huge standing Buddha called Luang Po Yai is visible from a lot of places all around town. Make your way right into the court yard of the temple to see just how enormous it is: 59.2m head to toe and 67.8m from ground to tip. There’s no admission fee to enter the temple, neither for Thais nor for Farangs. 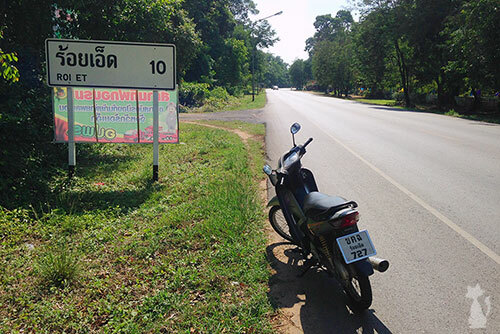 Some 30km east of Roi Et town is Wat Pa Non Sawan and again, if you only have half a day to explore the countryside, that’s the one you will find the most interesting and rewarding. It’s basically a big park full of sculptures of animals like dragons, elephants, turtles and Hindu gods. Make sure you don’t miss out the sculptures at the very end of the complex (behind the tower) which illustrate scenes from hell, like the women who had an abortion get punished, liars are forced to drink poisoned water, unfaithful women are hanging from trees and people who treated their parents disrespectfully have grown incredibly long, thin and tiny mouths. Very remarkable, you can see it right at the end of the video I took there. Situated on top of a hill and just a stone throw from the neighboring Mukdahan province, amongst lush hardwood trees and wild animals like boar, red junglefowl and deer is the newest and one of the most impressive temples in all of Isaan: Wat Pha Nam Yoi. It has a beautiful and spacious courtyard with flowers and fountains surrounding one of Thailand’s largest chedis: Phra Mahachedi Chai Mongkhon. 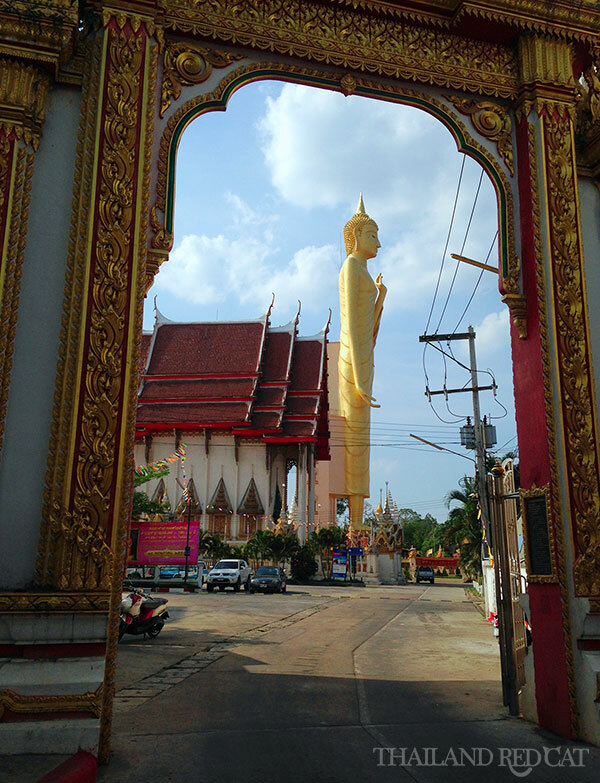 The temple is located about 90km from Roi Et town and so you should really make it a day trip. I rode my old rented motorcycle all the way there and it took me about 2.5 hours. I believe they have minivan services too for about 1,500 Baht. Make sure you walk up the stairs to the top of the chedi and you’ll get fine views of the temple and the rice paddies and countryside of Isaan all around. As of today there is no admission fee to enter Wat Pha Nam Yoi but donations are appreciated as they use them to directly fund improvements and further constructions in and around the complex. I was told that Wat Pa Kung has the same owner as Wat Pha Nam Yoi (see above), and if you enter the cool inside of the temple there’s a miniature model of the “big brother” that made me decide to give it a visit the following day. Wat Pa Kung kind of reminded me of Borobudur in Indonesia, however it’s not as sophisticated and with love to the detail, frankly speaking a little plain. Still worth a visit, it took me about 45 minutes to reach it from central Roi Et by motorcycle. It might not be as diverse and impressive as the Siam Ocean World in Bangkok, but for 30 Baht you can’t go any wrong either. The Roi Et Aquarium is located near the southern end of the Bueng Phlan Chai and has 24 medium-sized tanks as well as one big 8 by 16 m sized tank in form of a underwater tunnel holding plenty of fresh water fish. You can find more videos of Roi Et during day & night time on my youtube channel.